They’re all fine and good options — and you should definitely give each of them a try if you haven’t already — but they’ve been in our dinner rotation for as long as I can remember. Almost every single one of them was posted in the first year (or month!) of Dinner: A Love Story’s existence, and for those of you paying attention, that was eight years ago. So last week, when I was in my six-thirty stare down with a pound of ground thighs (always, always get the dark meat), I decided to break the eight-year rut and try something different. What I really wanted was an Asian inspired meatloaf ca. 2012 that Andy and I loved, but my meatloaf-hating girls refused to touch, so I set about reworking it into an easier-to-digest format, i.e. meatballs. And not pan-fried meatballs that you generally finish cooking in sauce. I didn’t have a sauce in mind and I didn’t feel like splattering grease all over the stovetop — instead, I tossed the turkey with herbs and aromatics and went in the baking direction. While they cooked, I separated a head of Bibb lettuce for wraps, made a simple drizzle sauce, and sautéed a few green beans. Twenty minutes later, Abby came down from a marathon homework sesh and plucked a meatball off the baking sheet. “It tastes like the inside of a dumpling,” she said. (They did!) And then: “Is this all we have for the whole family?” (It was!) “Because I could eat every single one right now.” I guess it’s a nice problem. For those of you keeping track of things we’ve moved on to the Paleo-ISH phase of Phoebe’s Paleo regimen. Hence my inclusion of hoisin and green beans (neither of which are paleo) even though I replaced the usual breadcrumbs with potato starch. (You can definitely stick with breadcrumbs, for whatever reason, bread in any form is a real line in the sand for her.) This serves four light eaters — I think we could have each eaten about 10-15% more. Feel free to add some brown rice if you need something starchy. Preheat oven to 425°F. In a large bowl, combine all meatball ingredients using a fork. Place a piece of foil on a standard size rimmed baking sheet and coat lightly with cooking spray or brush with a light coat of olive oil. Form meat into 1-inch balls, and place on the cookie sheet. Bake for 15 minutes. While meatballs bake, make green beans. Add both oils to a skillet set over medium heat, and add garlic, cut-side down to infuse the oil. Add red pepper flakes and green beans and stir until beans are almost wilted. Add sesame seeds and cook until they are toasted, another minute. Remove garlic and serve. Combine all dipping sauce ingredients into a small bowl. 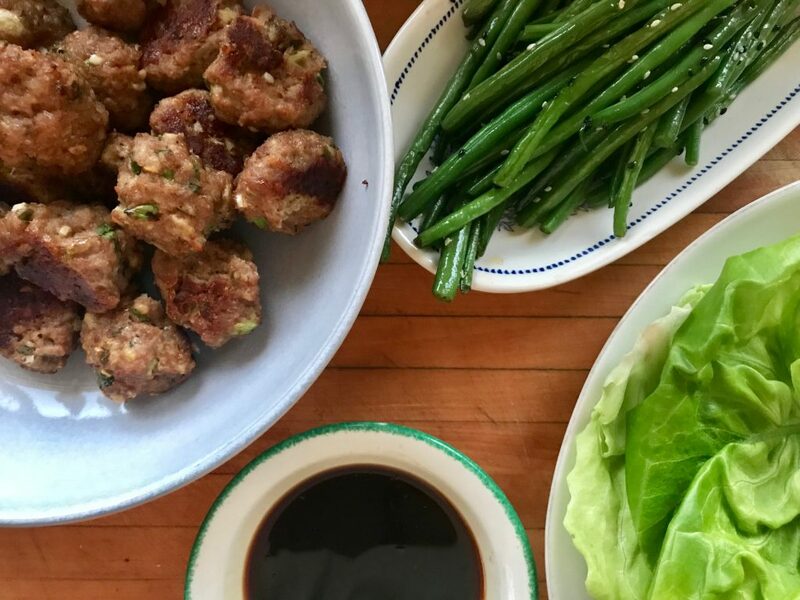 Place lettuce leaves on a platter and serve along side beans and meatballs. Have each person wrap one or two meatballs in a leaf, then drizzle sauce on top. These looks amazing – I think my kids would love them! I will try the whole meal as soon as I find the turkey! Thanks! Haha ‘turkey haters’ – as a reader from across the pond I can answer the question. It was just not available widely here until the last year or so. And you still can’t buy organic or free range turkey here. The other one we struggle with on the paleo front is Bison – not a lot of those in the UK. aha! thank you for enlightening me! When I lived in Germany over 20 years ago, I decided to make an “American Thanksgiving” dinner to share with friends… the only problem was finding a turkey! I think I ended up with a large bird of some sort that was NOT a turkey- ha! A friend who had lived in the states kindly requested we have chocolate chip cookies for dessert instead of pumpkin pie, so that spared me the impossible task of finding pumpkin! I live on the border between France and Switzerland and ground turkey is impossible to find in either country – you can get turkey breast in France, and ground chicken in Switzerland, but that’s it! Ground beef, on the other hand, is everywhere! Chiming in to confirm that prepackaged ground turkey is not available in France. The only way to have it done is to place a special order with a butcher – they’ll grind it last thing at night before they sterilize the meat grinder, but otherwise they’re not allowed to do it because of cross-contamination. On the other hand, when you ask for steak haché, you can watch the butcher grab a handful of fresh, lean, beef cubes, throw them in the grinder, and then press them into patties with his special contraption – all right in front of you. And if you ask for four steaks and the butcher, say, knows your family, he might even make two adult-sized and two kid- sized steaks. I miss ground turkey, but I love the process of getting fresh steak haché ! Do you think ground chicken thighs would work? They are easier to find in smaller quantities here than turkey. Definitely. The only ground chicken I find is usually breast meat, though, which I find aggressively bland. If you can find thighs, go for it. totally winging it here, but I’d say 1:1, with maybe a little more breadcrumbs to the potato starch. Any one out there know better than me? Mouth is watering! I’ll be making these soon. We tried this last night and it was so tasty! A definite addition to our list of “keepers from Jenny”! We made this tonight. 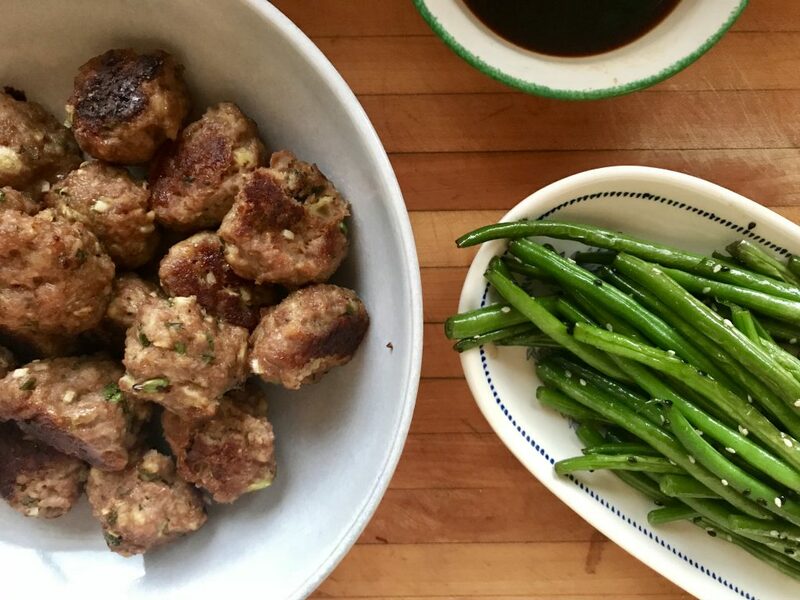 Our 11 year old said, “this is delicious!” Our 9 year old, who normally talks straight through dinner to avoid eating the food put in front of him, was silent, just shoveling meatball after meatball into his mouth, then helping himself to more. I call that an unqualified success, and we are making a note to ourselves to double the recipe for next time! Made this tonight, it’s delicious and so easy! Keeping it on rotation. Thank you! These were REALLY good! My picky eater really liked them, especially when I said they were a kind of potsticker filling as he loves those. I liked them so much that I am going to make the recipe into turkey burgers for the grill as I don’t like ground beef but need something to BBQ when the others are having hamburgers. This recipe was serendipitous as I found organic ground dark meat turkey at TJ’s last week. PS: I served the meatballs with brown rice, which was a great combination. Thanks for sharing this.Will try this on weekend. Woah, a new way to enjoy meatball, I love that! I love meatball’s flavor though we dont need a lot of time to cook it. These were awesome! My 6 year old and 7 year old gobbled them all up. The “greeny beanies” as they called them, were great too. I skipped the lettuce, and made some brown rice to serve with them. These are definitely going into the rotation. Also…I marinated a tri-tip in Tony’s Steak marinate last weekend and it was amazing too! Thanks, Jenny! You are a lifesaver!! !